This is the first of two posts about the Duck Shepard robotic arm. This post will be an overview of the project and the second post will contain more technical information. Recently there have been a stream of interesting robotic innovations. How could someone not get excited at a giant piloted American robot challenging an equally imposing Japanese one? How can anyone resist the desire to have a robotic chef capable of imitating Michelin cooks? In an effort to develop the knowledge and skills to recreate one of these, I decided to make a robot of my own. What came out is the Duck Shepard robotic arm. This robotic arm has been programmed to find and retrieve nearby objects. Over this project, I have ordered the robotic arm to herd a wild pack of rubber ducks. Here is a video overview of the project. This project should be instructive if you have ever wanted to start your own robotics project as it covers communicating and controlling robotics servos. 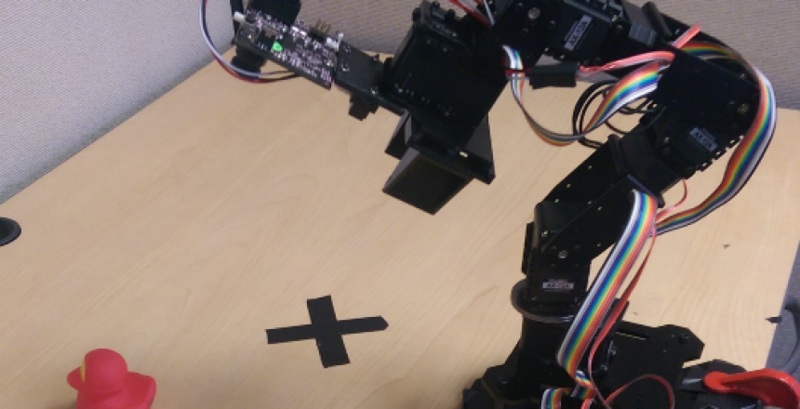 If you are not a robotics fan, this project may still have something for you. The project includes a Wifi module and an Android phone app to offer wireless control of the project. It also includes a Pixy camera that add color recognition to the project and an IR distance sensor which uses the analog-to-digitial converter on the Netburner microprocessor. Main Components: These are the parts that are essential to the robotic arm. To learn more about how the Duck Shepard robotic arm works, continue on to read Part 2 of this post where you can also find the source code.